A trusted solution for your digital marketing needs. Email verification has really improved my email deliverability. I no longer get fake email addresses, and no longer have a problem with hard bounces. My email open rates are higher and everything is performing better. I’m glad I found the Xverify tool and would highly recommend it to everyone. Data quality is an essential part of digital marketing. When you are working with lead suppliers, you never know what kind of data will come into your marketing funnel. Xverify has solved this problem for us. This is a tool that we can trust when it comes to email verification accuracy. After looking at other email validation vendors, our marketing team choose to go with Xverify because of the added benefits. Having the additional hygiene process to detect complainers and high risk email accounts protects our reputation. Xverify is the right choice for the job. My email newsletter is one of my best ways to increase user engagement with my site, but I noticed that my deliverability had decreased. After I implemented Xverify, to make sure I was only collecting valid emails, it helped get my numbers back up, and increased viewership on my site. I had used other email verification services before, but Xverify sold me on their additional data benefits. Being able to flag complainers was highly effective with lowering my spam complaint rate. It single handedly saved my sender reputation! Eliminate your Hard Bounces. It's that simple. As your data quality improves, so will your sender score. Engaging in the best practices will boost your campaign performance. Want to quickly and effectively clean up a large dataset? We have a great drag and drop uploader, or access to an FTP. Don't just collect data blindly. Make your data intelligent. We help you separate the good email addresses from the not-so-good email addresses. For example, knowing which accounts are likely to generate spam complaints can give insight to which recipients not to email too frequently. We offer a variety of ways you can implement our tools to validate your data. Good data quality is your golden ticket to improved email deliverability. As we regularly cleanse your data from hard bounces, help keep you safe from high risk email accounts, and aim to reduce your spam complaints, your sender score will improve. How long has it been since you cleaned up your old customer data? It is a good practice to regularly clean the data you have, especially if it has been over a month since you mailed it. We will be able to help you identify which accounts are no longer in use and which ones are likely to generate spam complaints. Don't just collect data blindly. tools to validate your data. up your old customer data? through our built-in fraud protection to make sure it is not a temporary account, or linked to an online fraudster. Accuracy is the key to data quality. Our tools are proven to be 98% accurate across all major email domains such as AOL, Yahoo, Hotmail and Gmail. A majority of our responses occur in less than one second. Being able to instantly alert your end users when they input information incorrectly helps them correct mistakes. Alert and convert your leads in real-time. 10% of invalid data is from typos alone. Our built-in auto correction can easily notify the end users when they spell a domain incorrectly, such as Yahooo, when they likely intended for Yahoo. Weed out the unwanted email IDs and keep the ones that are more likely to engage. Let's face it, typos happen. If it was something as simple as Yahoo.com, we can fix it. We find that over half of end users will correct their username typos if you notify them - Alert & Convert. and smartphone autocorrection from giving you the wrong information. Stay a step ahead of the curve and Verify on the Fly. 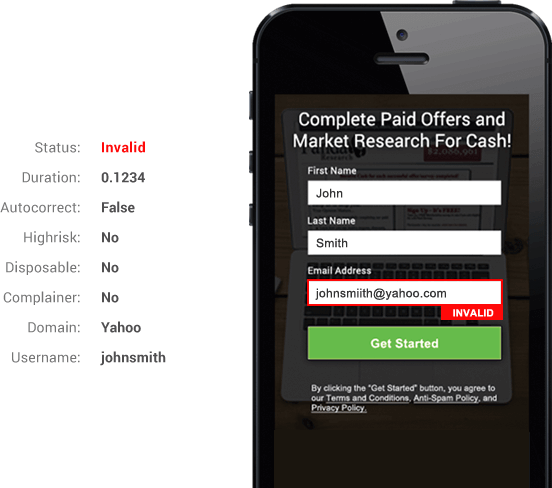 Avoiding conversion loss due to user input errors is critical for your success. Simply integrate our API into your web form or mobile application and emails will be verified as they are entered. Xverify offers 100 free verifications. Purchase additional verifications on demand. No Minimum Requirements. No Setup Fees. Volume Discounts Apply Depending Upon Total Verifications Per Month.